When it comes to the world of digital cameras, it is safe to say that we are more or less spoilt for choice. After all, there are plenty of manufacturers out there with a gamut of offerings to choose from, that the uninitiated will definitely lose their way around unless they have different sites to help guide them select the camera that best suits their needs and requirements. Without much further ado, here we are with the Sony Cyber-shot RX1 that will boast of a 35mm full-frame image sensor and wide aperture f/2 lens, where it is touted to be the first full frame point-and-shoot digital camera in the world. Anyone else beg to differ? Let us check out just what the Sony Cyber-shot RX1 offers in the extended post. As tipped earlier, the Sony Cyber-shot RX1 comes with an advanced 35mm full-frame 24.3-megapixel Exmor CMOS sensor and exceptional Carl Zeiss T*t 35mm f/2.0 fixed lens, being carried on a highly portable, lightweight camera body. Tipping the scales at just slightly more than a pound, it is by far and large smaller and lighter than any full-frame DSLR without sacrificing image quality, HD video quality or manual control. Of course, there is a price to pay for that, but we will get to the pricing details at the end. With its unified lens and body design, the Sony Cyber-shot RX1 delivers performance which few interchangeable lenses are able to match, boasting a near-silent in-lens shutter and is far more compact than comparable lenses of interchangeable design. Full manual control options as well as an intuitive user interface make life easier for photographers to adjust all settings quickly and easily. With the 35mm full-frame sensor within, the Sony Cyber-shot RX1 more than doubles the area of APS-C sensors commonly found in much bulkier DSLR cameras, letting it take in far more light when shooting. This means the camera’s sensitivity range is a generous ISO 100 – 25600, letting you shoot as low as ISO 50 in expanded sensitivity mode. 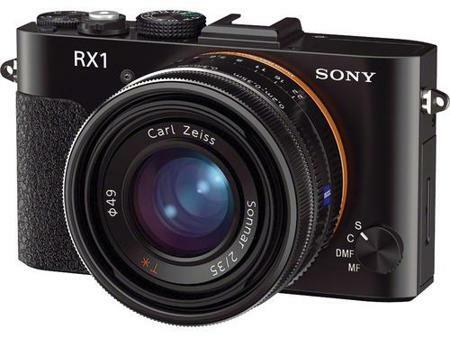 The asking price for the Cyber-shot RX1? A rather wallet burning $2,800. Any takers?